SPRING IS IN THE AIR! BOOK YOUR SPRING GETAWAY NOW! Are you looking for a secluded place to spend some quality time with loved ones? Well we have the place for you! Our cabin sits back on 85 acres of land. Fully equipped with everything that you will need to make your stay as comfortable as possible. Hike the 85 acres, enjoy a fire by the firepit, relax in the hot tub on the spacious deck, fish in the stocked pond and take in the view. Restored 1800's rustic cabin featuring 3 bedrooms plus a loft and 1 bathroom. Refinished flooring on 1st floor with fireplace, large dining table, laundry on-site, flat screen TVs and dvd player with video library, foosball table, hot tub, grill, and screened in porch. Wifi is available. We are located just a short, 24 mile drive from Old Man's Cave, 16 miles from Lake Logan, and 24 miles from the Hocking Hills State Park. Be amazed at the beautiful scenery and waterfalls. Enjoy the Hocking Hills Winery at only 15 miles away and Hocking Hills Moonshine Distillery at 13 miles away. Whether you are looking for a relaxing stay at our 'home away from home' or you are interested in the several activities near by, you will be sure to enjoy yourself. 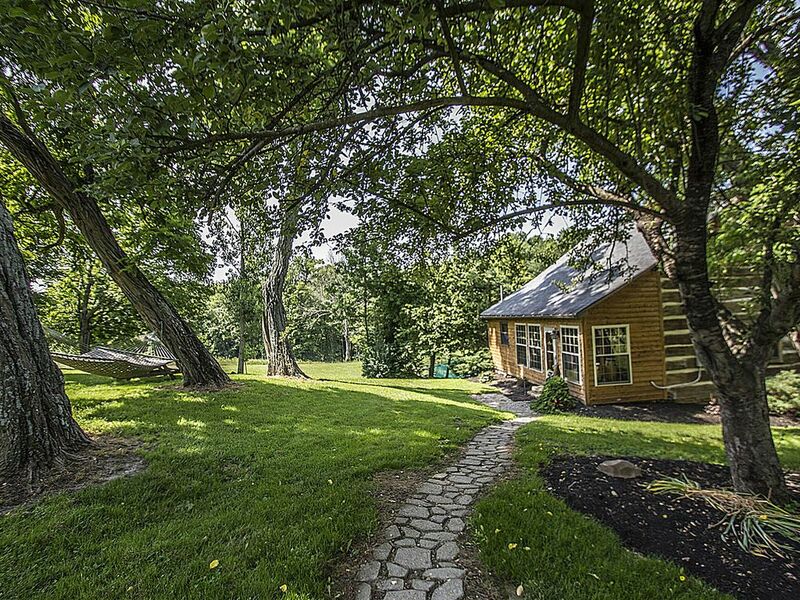 You will enjoy taking a step back in time and staying in this completely restored 1800's log cabin! Our cabin still has the original wood planked walls and flooring, yet has been updated with all the modern touches! You have 85 acres all to yourself to do whatever your heart desires. We had a fantastic time and the cabin was perfect! The cabin was clean, was fully equipped and was decorated nicely. We relaxed, took a walk and enjoyed the hot tub. We will definitely book the cabin again. Thanks Cindy for your professionalism and kindness! Thank you for your kind words. I am so happy you enjoyed your time at Curly's Cabin relaxing and getting away from everything. It was great to meet both of you and I look forward to your next stay! The cabin is beautiful and the setting is very peaceful! The deck needs some repairs (fine with me but was noticable). The pond could be cleaned to be a little more eye appealing and starter wood for the fire would be nice if possible for those who purchase wood. For the positives- love that the place is authentic and cozy. Very spacious! Cupboards were well stocked with all we needed. Easy check in and out. Thank you for a great stay. Really loved our stay and the cabin. However, we were on a girls weekend and part of our ideal trip was being able to relax and hang out in the hot tub. We went to get in Friday night only to realize it was cold and would not heat. We called the emergency number twice Saturday and also left a message and our call was never returned. We spent a good couple hours Saturday afternoon figuring out what was wrong and how to fix it ourselves so we could use it Saturday night. We are happy you loved your stay at Curly’s Cabin! Unfortunately we did not get any calls stating the hot tub was not working properly. The hot tub is brand new and we have had no issues with it not heating correctly. The temperature must have been turned down from the previous guests. We are sorry for your inconvenience. Thank you for your feedback, it helps us to know what we are doing right and what we need to improve on. Beautiful cabin. Loved the fishing and evening fires. We had a great time. Thank you for sharing your cabin with us. Thank you for your kinds words! We are so happy you enjoyed Curly's Cabin and all it has to offer. The pond and fire pit are our favorites too! We look forward to seeing you back real soon. Curly’s Cabin was a heavenly place. The cabin had everything we needed plus more, from the prongs for s’mores to the jacuzzi! It was a perfect weekend! Thank you for your kind words! We are so happy you enjoyed spending time at Curly's Cabin and everything it has to offer. You can't beat a great s'more on the fire surrounded by friends. Look forward to seeing you again. Rates are subject to change until reserved. Rates may vary per holidays and travel season. Quote is based on occupancy of 8. Any additional guests over 8 will be charged at a rate of $20 per person per night for 2018.